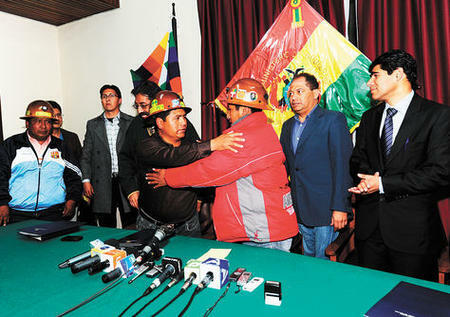 Rival mineworker factions have signed an agreement with the Bolivian government to end a violent dispute at the Colquiri tin mine, Bolivia’s second largest, which has rocked the country for months. The conflict offers a window into the complexity of Bolivia’s mining sector, and the challenges faced by the government as it seeks to balance the contradictory expectations of different constituencies in reasserting popular control over Bolivia’s mineral wealth. “What’s happening now is an example of the contradictions and difficulties that we face after nationalization,” says mining minister Mario Virreira. Rival mining groups reach agreement. Credit: Nicolás Quintero, La Razón. The conflict at Colquiri centers around competing demands for control of the site’s most lucrative minefields by salaried, unionized mineworkers and independent, cooperative miners, each having long-standing historical claims to the site. Under an prior agreement reached with both groups last June, President Evo Morales revoked the mining license of Swiss commodities giant Glencore at Colquiri and turned its operations (and workforce) over to COMIBOL, the state mining company. At the same time, COMIBOL granted a 30-year lease to cooperative miners at the site’s Rosario vein, worth an estimated $5 billion--honoring a prior concession made by Glencore in an effort to ally with the cooperative against nationalization. A subsequent dispute over the boundaries of the cooperative’s concession led to renewed clashes and work stoppages at the mine, with production losses exceeding $5 million. The head of COMIBOL resigned. In late September, road blockades mounted by the National Federation of Mining Cooperatives (FENCOMIN) in solidarity with Colquiri’s cooperative miners disrupted commerce throughout the country. The entire nation was shaken on September 18 when a march by cooperative miners in La Paz turned violent. A Colquiri mineworker, an ex-cooperative miner recently hired by the nationalized mining company, was killed in a dynamite explosion at the headquarters of the national mineworkers’ union federation (FSTMB). The episode evoked bitter memories of the 1980s, when revolutionary union leaders were assassinated at the same site by the dictatorship—only this time, it was miners killing miners. Despite occasional differences, both the FSTMB and FENCOMIN have been strong political allies of Morales. While the new agreement resolves the immediate dispute by dividing the Rosario vein more equitably between the parties, the events at Colquiri reveal the broader conflicts and contradictions within Bolivia’s mining sector and the historical forces that have shaped them. Colquiri miners. Credit: ANF.The history of the Colquiri mine dates back to colonial times, through the era of tin baron Simon Patiño, and nationalization after Bolivia’s Revolution of 1952. In the 1980s, pressure from international financial institutions and a catastrophic fall in world-wide mineral prices led to a shutdown of the government mines, including Colquiri, displacing 25,000 unionized miners nationwide. 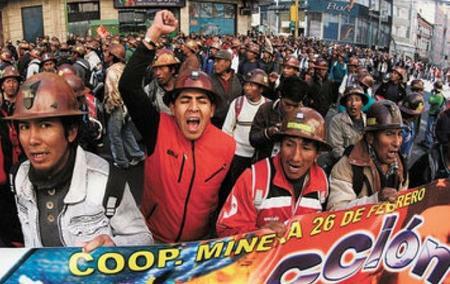 Privatization of the mines in the 1990s under neoliberal structural adjustment policies further weakened COMIBOL and destroyed Bolivia’s miner-led revolutionary trade union movement, once the most combative in Latin America (and perhaps the world). The Colquiri mine was sold in 1999 to a company owned by ex-president Gonzalo Sánchez de Lozada (Goni), the primary architect of structural adjustment who would be ousted by a coalition of popular movements four years later. Colquiri was purchased by Glencore in 2004, after Sánchez de Lozada fled the country. The cooperative mining sector began to flourish at Colquiri (and elsewhere in Bolivia) when the government mines shut down, encouraged by successive neoliberal governments to buffer the consequences of massive mining dislocations. Associations organized with virtually no investment allowed ex-miners to eke out a modest existence by exploiting accessible veins and selling their products at depressed prices. In recent years, with sky-rocketing mineral prices, the cooperative mining sector has expanded rapidly, attracting new constituencies such as farmers seeking to supplement their dwindling agricultural earnings. When the Colquiri mine was nationalized last June, its workforce included an estimated 1,000 - 2,200 cooperative miners, as compared to 400 salaried miners on Glencore’s (and then COMIBOL’s) payroll. Nationally, the cooperative sector now includes at least 100,000 miners, up from 50,000 just 5 years ago. By comparison, an estimated 10,000 mineworkers remain in the private sector and around 7,000 are employed by COMIBOL. With these numbers, the cooperative mining sector has emerged as a powerful and vocal political force under the Morales government. As Bolivia’s Andean Information Network explains in their analysis of Bolivia’s mining challenges, after two decades of a struggling existence, cooperative miners believe they are now entitled to benefit from soaring mineral prices. Along with the private mining sector, they resist nationalization, fearing that state control and forced upgrading of the industry will rob them of increased earnings. With their current veins rapidly becoming depleted, the cooperative sector has exerted growing pressure to expand their mining concessions, leading to conflicts such as Colquiri. An even more tragic dispute occurred in 2006 at Huanuni, where 16 died and 115 were injured as cooperative and salaried workers clashed over access to the richest mining veins (promised by the private mining company to the cooperatives, in a tactic later repeated at Colquiri). Morales has described this crisis as the saddest and most difficult of his presidency. Colquiri miners. Credit: La Epoca. 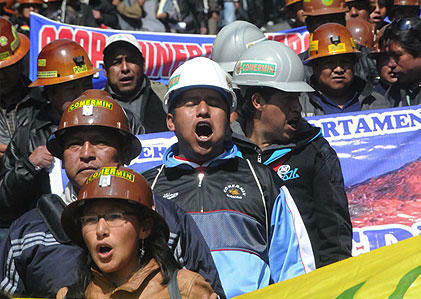 The Colquiri conflict has brought competing visions for Bolivia’s mining sector into renewed focus. While the 2009 Constitution recognizes a plural mining economy (public, private, and cooperative), a Supreme Decree promulgated by Morales on May 1, 2007 declares all of Bolivia’s mineral wealth (except for previously granted concessions) to be a patrimony of the state. In particular, Colquiri has reignited a heated debate about the role of the cooperative mining sector. Critics charge that few mining cooperatives today are collective entities with a social purpose. Rather, they have become another hierarchical form of private enterprise, controlled by a small and increasingly privileged group of associates (stockholders) who subcontract to an exploited, largely temporary workforce, paid only for what they produce. According to some estimates, up to 75% of cooperative miners do not receive health insurance or pension benefits. The sector commonly ignores health and safety laws, and uses primitive extraction techniques that exploit the environment and shorten the life of the mine. 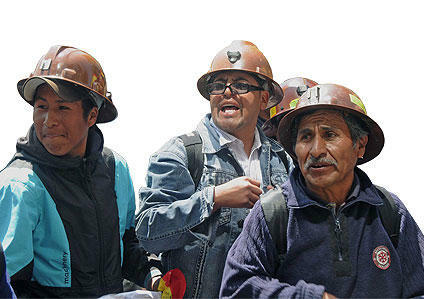 Cooperative miners are also exempt from paying taxes to the state (increased under Morales to 37.5%). Still, cooperative mining is a reality in Bolivia today. Defenders of the sector argue that it generates 85% of mining employment, absorbing cyclical dislocations, strengthening domestic demand, and bolstering the local economy. For many in neglected peripheral zones, it is the only available means of subsistence and social mobility. Supporters of cooperative mining note that the sector works primarily in zones that COMIBOL lacks the capacity to exploit, constituting only 4% of the state’s total mining area. Additionally, mining cooperatives do pay departmental royalties (1% - 7%), as well as annual fees for their lease concessions. Unlike the resolution of the Huanuni conflict, where the government nationalized 100% of the mine and successfully absorbed virtually the entire (4,000 member) cooperative workforce, the Colquiri settlement appears to grant significant concessions to the cooperative sector. In addition to bifurcating control of the site, COMIBOL has only committed to add another 800 workers to its payroll, in addition to the 400 inherited from Glencore. Some 700 cooperative workers have already signed on with COMIBOL, taking advantage of the opportunity for stable employment and benefits. The workforce limitations guarantee that Colquiri’s cooperative sector will continue. Credit: La Epoca.Additionally, in exchange for FENCOMIN’s agreement to lift its road blockades, the government has promised to “partially lift” the Supreme Decree declaring Bolivia’s mining wealth to be a public reserve. This is expected to pave the way for approval of some 467 cooperative mining contracts that are currently pending. The Morales government has characterized the Colquiri settlement as “historic.” But to prevent more violent clashes like Colquiri (and Huanuni) from occurring in the future, it will need to move beyond “putting out fires” to articulate a clear policy, in the form of a mining code, that defines the respective roles and opportunities of each component of the mining sector. This project, which has been stalled for some time by the inability to reconcile competing interests, represents a major political challenge for Morales--especially since losing the support of either the cooperative or the salaried mining sector could have serious consequences for his political future.